2. Miss Denise Van Outen's 12th century Kent cottage. 3. Arsenal Goalkeeper Manuel Almunia's home. I have discussed with Ian an idea to contact famous celebrities that have had reports of their homes being haunted with the hope that we can get to investigate one of them. This will help boost our attention in the media and may lead to bigger and better things for G.P.S. I read a report this morning that a BBC reporter took an unusual photograph at the reputedly haunted Edward Jenner Museum in Gloucestershire last week. I have emailed the museum director and called to leave messages for her today in the hope that we can investigate this location soon. I have also contacted the BBC to request them to cover the story further and follow us on this one. Teddington Studios have replied and I will be following this up again. I am still waiting to hear about the Edward Jenner Museum. 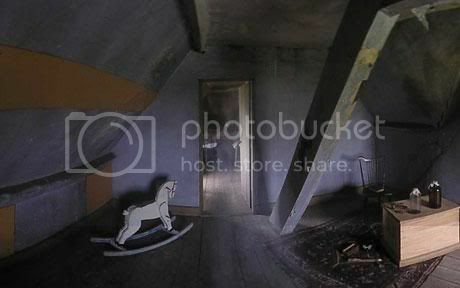 That picture in the museum looks quite interesting , looks a spooky place anyway , lets keep our fingers crossed. All theses location sound great barri lets hope we can get them all...or even one? The Manager Ray Gearing, emailed me back again to say that the Auction World TV events several years ago must have been made up to increase their sales or something. He said that if any accident or near miss had occurred at the studio he would have been notified immediately and risk assessments carried out. He has worked there for 41 years and has never experienced anything paranormal or had to deal with it in the course of his job. I believ him, and think that it may be a dead end trying to chase this one further. The agency that deals with her management, has not yet replied. I will send them a gentle reminder! The director is having a meeting with the trust this week to discuss the offers she has received. I did email her back to sell our services as best as I can. I explained that we are the best!!! Lets hope we get that one folks as the publicity and attention would be great. 4. The National Trust properties have not all replied to me. Two have turned us down flat and the rest have just ignored my requests. 5. I called and spoke to BBC Radio Oxford on Thursday and asked them to help us secure new locations throught Oxforsdshire. The producer is more than happy to promote our services and cover any story that emerges from this. she has forwarded my email request to other staff that will promote us on air and in their newsletters, magaznes, and on-line. I hope we do get a call soon. So that is the latest update folks. If any of you have a possible location you would like me to contact, please email me and send me a brief description, photograph, and contact details of you can.